How to setup for the driver with RotarySwing Tour. If you're looking for maximum distance off the tee, your setup with the driver is key. There are a few critical pieces of the setup that you'll want to understand that Chuck Quinton covers in this video to teach you how to start bombing your drives past your buddies! A lot of golfers ask, should the golf swing be the same for every club in the bag? Absolutely. 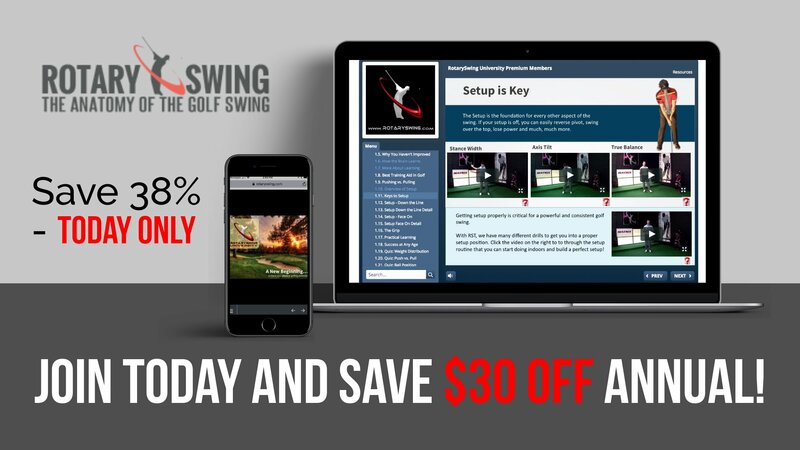 You don't want 12 different golf swings. But, at the same point, the driver, especially over the last 10 years, has changed dramatically in its design. Now that we have launch monitors available very easily you can see how setting up and using the equipment the way it's designed now can get you a lot more distance if you use it correctly, but at the same point, there are adjustments to your golf swing that have to be made. What you're going to find is that if you swing exactly the same with every club in the bag, the whole point of that is to be able to get your golf club release point and the swing to feel exactly the same. You won't be optimizing the driver to hit it as far as you possibly can. Is that necessarily a bad thing? If you look at the Tour average, they hit down about 1.3 degrees. SO they have a negative angle of attack of over a degree. Of course, we all know that if you want to hit the ball as far as you can, you want to catch the ball on an upswing slightly. Depending on your swing speed, that's all going to vary a little bit. But typically a few degrees is enough to get you quite a bit more yardage and get the ball to fly a little bit further and carry a little bit more distance overall. So why do the Tour pros hit down on it when they know that they can hit it further? The reason is the same thing that I've been teaching you to get your release point in the same point every time for consistency. They have enough speed to give up a little distance for the sake of accuracy and consistency. I do the same thing. My negative angle attack is almost exactly the same, about 1.4 degrees. So I hit down on the ball a little bit, and I hit the ball a little bit lower and it costs me some yardage. But my release point feels the same with pretty much every club in the bag. Now, there are times, though, where I want to hit the ball a little bit further. I need to get it to carry that extra yardage to carry a bunker or a hazard, and land softer and fly a little bit higher, or take advantage of some wind to get to a long par-5, et cetera. And those are times when I won't hit down on the ball as much. So my swing, I will make adjustments. That's what I want to show you here. So, I've got a yellow ball here that's going to show where I would have the ball and how I would set up normally on a normal stock golf shot. This is where I'm going to hit down on the ball a little bit. So ball's going to be basically in the exact same spot it always is, just a hair forward, just so I can take some negative angle of attack out. Because with my irons I'm about five or six degrees down. So the angle of the shaft or the line helps a little bit but to give us a little bit more I'll move it just a hair forward, we're talking half a ball width, for a stock shot. But it's not enough to make a dramatic difference. That's going to be my normal set up and I've got this shaft here so you can see it, because I'm going to show you how I adjust my alignment a little bit to make this work. As I come into impact with his yellow ball, my face should be squared up. Now this white ball up here is about six inches in front of this one and the reason for that is, in a second I'm going to show you how I would adjust to hit the ball higher. But by the time I release here, the club face would be slightly shut in relationship to my yellow line here, my alignment line. So if I didn't hit the yellow ball and I hit the white one instead, the ball would go left of my target line. It'd be a big pull because the club is working on an arc and it's working back to the left, and shutting down, so by the time it gets to that ball the club face is going to be closed. So this is going to be a straight shot, this is going to be a pull. But I need that shot sometimes where I want to hit it really high and get some more carry out of it, so the ball's got to be up in my stance closer to where this white ball is, so what do I do to adjust for that? Well, let's look at this logically. First of all, if my face is square with the yellow ball and now it's going to be shut up here but I want it to launch on that target line, how would I do that? The simple answer is I would square up ... excuse me ... close my set up just a little bit and that's going to allow me to get a positive angle of attack and get the ball to start on my target line. Because now, as I said earlier, this is a pull but if I close my stance I'm now set up to the point where this club face would now be squared up instead of a pull. If I went open with it, this would be a bigger pull. All I'm going to do is adjust my set up a few degrees, enough that the club facing is now going to match up with my alignment, here. If I'm set up here and now I'm here, the club face is now just going to be square to where I'm aiming and I'm going to be releasing at that point with the driver. All you're going to do in order to get the ball to launch a little bit higher and create a little bit more positive angle of attack, which you can accomplish by moving the ball up in your stance slightly, is alter your stance slightly shut. So now in relationship to where your swinging, the club face would be square to your alignment at impact but shut in relationship to your body, where the ball is at impact. Again, this is normal. This is squared up now for a positive angle of attack. All you need to do is just adjust your set up slightly shut and the ball will come off square to your target line and that will help you create a more positive angle of attack with a little bit more carry out of it. At the same point, I think it's very, very important that you practice hitting a lot of drives in your normal ball position with the driver. They're going to fly very low in relationship to what this other one's going to do, but it's important to teach yourself how to release the golf club in the same point with every club in the bag so that you have the release points the same. That's going to help you learn to hit the ball straight with every club in the bag. Like I said, your driver's going to fly low, you might take a little bit of a divot with the driver when you're practicing this. Perfectly okay. I have a lot of my Tour players purposely do it because they start getting to this point where they try to create a lot of secondary axis tilt to create a really positive angle of attack and so now all of the sudden we've got to fix that. I start having them work on staying more tall and hitting down a little bit so that the driver releases just as a 3 would or 3-iron or pitching wedge would. Then, once we've got that zeroed out and everything's squared up, the ball's coming out low but on line, then we make little set up adjustments to allow them to create a positive angle of attack without trying to get their spine leaned way back at impact. Because you want your body to be basically the same for every club in the bag. So change your golf driver setup just a little bit and that will help you hit the driver further when you need it, but practice hitting it square every time with your normal set up so you get the release point in the same place. Get Your Free Membership to Finish Watching "Driver Setup Adjustments" Right Now!